American rock band Coheed and Cambria comes from Nyack, Nyew York, US and it wad formed in 1995. 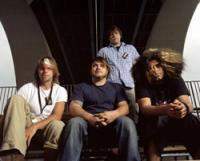 The band members are Claudio Sanchez, Travis Stever, Michael Todd, and Chris Pennie. The lead singer of the group Claudio Sanchez writes comics series called The Armory Wars and all band’s albums are based on its storyline. The debut album The Second Stage Turbine Blade was released in 2002 and the group became prominent. They toured in the US and Japan and this success allowed them to tour with such bands like Linkin Park and Slipknot. The next album In Keeping Secrets of Silent Earth:3 was very successful as it was certified Gold and you can download it from our site in mp3. Coheed and Cambria’s album spawned hits A Favor House Atlantic and Blood Red Summer. Videos for these songs were admired on MTV and they got MTVU Woddie Award for Best Album. The band released 2 more albums Good Apollo, I'm Burning Star IV, Volume One: From Fear Through the Eyes of Madness and Good Apollo, I'm Burning Star IV, Volume Two: No World for Tomorrow.